More and more organizations rely on outside contractors to provide vital services, from building maintenance to computer services and security. Hiring a specialized service provider is typically less expensive than managing the activities internally and it reduces risks and liabilities. However, if the service provider is not adequately insured and licensed, the organization is exposed to increased liabilities. While all companies verify insurance and licensing before issuing the contract, the insurance will invariably expire during the life of the contract. Despite potential liabilities and risks, many organizations still manage insurance and certifications with unreliable processes using spreadsheets, manual emails, and time-consuming phone calls. 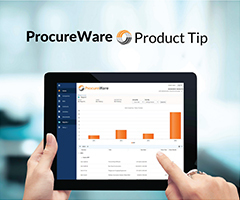 ProcureWare transforms the process, making it less time consuming and more reliable. When a supplier registers in ProcureWare, they are prompted to upload an insurance certificate and add expiration and coverage information. Contract administrators can choose what information is required in the registration process. They might require all suppliers to provide valid insurance certificates, or limit the requirement to suppliers under contract. After insurance is submitted, the contract administrator receives a notice. They then review the submission for accuracy and compliance with requirements. Once verified, they flag it as ‘internally approved.’ Once approved, the insurance or certification record can no longer be updated by the supplier so historical records are maintained. ProcureWare alerts can be configured to automatically notify suppliers and contract administrators of upcoming insurance document expiration. Suppliers can add new insurance or certification documentation before their original documents expire. The dashboard provides visibility into expiring insurance and allows the contract administrator to quickly identify potential problems. The Insurance and Certification Management toolset is included in ProcureWare sourcing suite at no additional cost. This integrated toolset helps contract administrators ensure that their contracts remain in compliance to minimize risk and liabilities from contractors. Contact the ProcureWare support staff for assistance with setup and configuration.